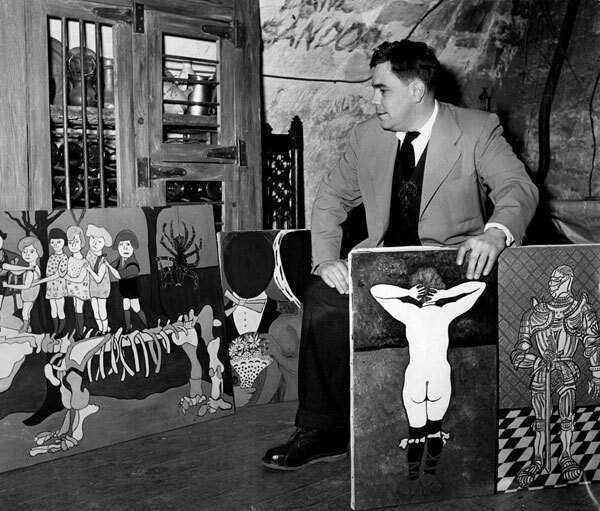 William N. Copley with his own paintings in Paris, 1951, two years after he closed the Copley Galleries and left Los Angeles. Photo: Mike De Dulmen. Courtesy the Estate of William N. Copley. It is fortunate for us that they didn’t. The Copley Galleries, founded by Copley and his brother-in-law, operated in Beverly Hills for just six months in 1948 and 1949. It may have been a spectacular failure, but it was also the inadvertent seed of one of the most important collections of Surrealist art in the United States. Years later, Copley would be the first owner of Marcel Duchamp’s masterwork Étant donnés (1946–66). He would also become recognized late in life as an accomplished and profoundly idiosyncratic painter. In 1947, Copley, adopted son of newspaper tycoon Ira C. Copley, was 28 years old. As with many young men, his world was shattered by his wartime experiences of combat in Europe, and he returned to California divested of any convictions about the direction his future should take. It probably didn’t help that his family was fantastically wealthy, nor that he had been an aimless student while at school at Phillips Andover and Yale. 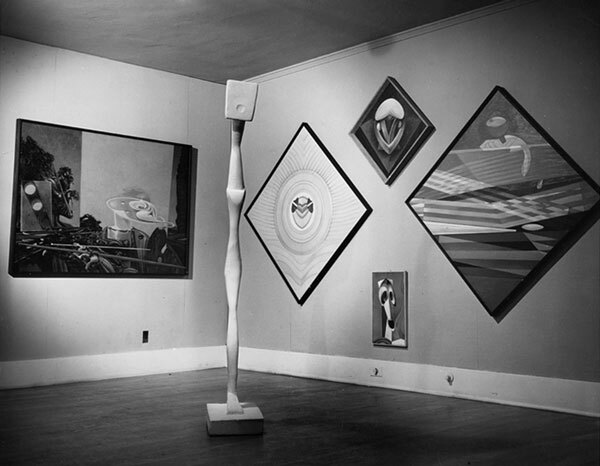 At this time in Los Angeles, there was scant interest in Surrealist art and little opportunity to exhibit or view it. Although local collectors such as Walter and Louise Arensberg were amassing important collections of advanced modern art, the few museums that existed in Los Angeles were reluctant to show it. The Los Angeles County Museum was, in Copley’s words, “a mausoleum of a structure […] which harbored some misacquisitions of William Randolph Hearst and a few stuffed animals.” 4 Further east, the fledgling, privately run Pasadena Art Institute had yet to receive its bequest, in 1953, of Galka E. Scheyer’s spectacular collection or to change its name a year later to the Pasadena Art Museum. It just so happened, however, that at around the time that the “whiskied” Copley and Ployardt were planning their Surrealist gallery, an association of assorted philanthropists that included the Arensbergs and the actor Vincent Price was inaugurating a nonprofit gallery on Rodeo Drive. The Modern Institute of Art opened in February 1948 “with the goal of becoming the West Coast equivalent of New York’s Museum of Modern Art.” 7 Its first exhibition included works by Marc Chagall, Joan Miró, Henri Matisse, and Marcel Duchamp—avant-garde artists of a stature rarely seen in Southern California but who, in the late 1940s, no longer seemed contemporary to Copley and Ployardt. The duo’s first stop in recruiting artists was the studio of the Surrealist closest to home. Man Ray, who had lived in Los Angeles since 1940, was disappointed that he had failed to carry his elevated status with him from Europe to California. He was recognized, if at all, as a photographer and had failed to make the inroads he had hoped to in the film industry. When Copley and Ployardt knocked on his studio door the second time, he let them in. The first time, one day around 11 a.m., he sent them away and told them to return at a more civilized hour. 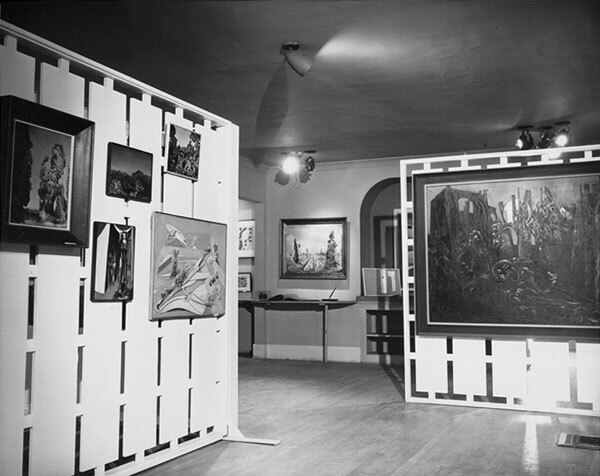 Man Ray agreed to an exhibition on the following terms: that Copley and Ployardt could guarantee the sale of at least 15 percent of the work and that he would have complete autonomy over its selection and hanging. A deal was struck, and the three became close friends. 10 Perhaps even more valuable to the fledgling gallerists, however, was Man Ray’s introduction of the pair to Marcel Duchamp. In the spring of 1948, they flew to New York to meet him. Back in Los Angeles, Copley and Ployardt were flush with the success of their trip. Ployardt quit his job at Disney, and Copley sold his house in order to afford the rent on a bungalow at 257 North Canon Drive in Beverly Hills. They paid $250 for a brass plaque with “Copley Galleries” inscribed on it. (Since the capital came from Copley—or rather Copley Sr., who died in 1947—it was his name on the door.) Then they bought a pet capuchin monkey, principally, it seems, because they would be probably the only gallery in the world with a monkey. Max Ernst exhibition at the Copley Galleries, ca. 1949. Photographer unknown. Courtesy of the William Nelson Copley papers, Archives of American Art, Smithsonian Institution. At the opening for the show, the monkey leapt on shoulders and guests worked their way through the free drinks with gusto. The next day, with no sales, the hungover Copley and Ployardt were getting nervous until a collector called Stanley Barbie lurched drunkenly through their door. After many more drinks, they sold him two Magritte paintings. It was to be the only successful sale that they would make. Copley had decided to apply Man Ray’s condition of 15 percent guaranteed sales to every show at the Copley Galleries. In order to fulfill this promise to Iolas, he was forced to buy a number of Magritte paintings himself. Magritte’s painting The Liberator (1947) currently hangs in LACMA’s Ahmanson building, acquired by Copley from his first exhibition in Beverly Hills. A pattern was emerging: The Copley Galleries, with or without its capuchin monkey, enjoyed fantastically raucous openings attended by glamorous guests and the occasional Hollywood celebrity, then failed to clinch any sales. The city’s serious collectors of modern art, of which there were few, simply weren’t yet confident enough to invest in art this unnerving and confrontational, despite the fact that its practitioners were all famous in Europe and some even in New York. Either that, or they lacked confidence in this brand-new gallery run by two irreverent young men with only a pet monkey for credentials. Finally, it was Man Ray’s turn. In the intervening months, Copley and Ployardt had seen a lot of the artist, which, Copley confessed, had its advantages and disadvantages from a professional standpoint. “Artists, like mothers-in-law, are often better appreciated when a certain geographical distance is maintained.” 22 Holding tight to his contractually agreed autonomy, Man Ray did not reveal until the last minute whether he would exhibit any photographs at all, so resistant was he to his prevailing reputation as a photographer. In the end, he did for the sake of commercialism, but he simultaneously published a text in the show’s catalog titled “Photography Is Not Art.” He called his exhibition, sardonically, “To Be Continued Unnoticed.” It included paintings from 1914 onward, photographs, Rayograms, posters done in airbrush on cardboard, and his iconic sculpture Cadeau (Gift) (1921), which consisted of an iron studded with a line of nails. The show was dominated by his large painting Observatory Time, the Lovers (1936), showing his former lover Lee Miller’s lips floating over the Paris Observatory. 23 At the opening, they transformed the bungalow’s front patio into a French café. Francoise Stravinsky served French onion soup and red wine, and the artist made a sign that read “Café Man Ray.” Again, nothing sold except for the 15 percent of works bought by Copley for his rapidly growing collection. In an instance of life imitating (Surrealist) art, Beverly Hills was blanketed in snow for the opening of Max Ernst’s exhibition. 24 The show, Copley claimed, was the first full retrospective of Ernst’s art ever held. It is hard to imagine how the one-story bungalow could accommodate the 300-odd pieces that were lent by collectors and dealers, including Julien Levy, Alexander Iolas, Pierre Matisse, Walter Arensberg, and Roland Penrose. Even New York’s Museum of Modern Art improbably sent their Ernsts to Beverly Hills. The Copley Galleries’ accountant was reportedly “the unhappiest bookkeeper on the West Coast”; by spring of 1949, the evidence of the business’s unviability was indisputable, and the gallery closed. 26 The Modern Institute of Art, similarly plagued by financial troubles, also closed its doors that spring. To Copley, Ployardt and Man Ray, a brief moment of heady excitement and possibility had come and gone. Ployardt reluctantly returned to work at Disney. Copley’s return to domestic life was unhappy, too; by 1950, he was living in a converted firehouse with his girlfriend, artist Gloria de Herrera. He was devoting more of his time to painting and, inspired perhaps by Duchamp, was also presiding over chess tournaments. In 1951, Copley, Herrera, and Man and Juliet Ray set sail from New York to Paris. Duchamp waved them off. Although as time went by he preferred to be known in his own right as a painter, Copley continued to collect Surrealist art. His collection grew and grew; it came to include Magritte’s famous The Treachery of Images (This Is Not a Pipe) (1929) and Richard Hamilton’s $he (1958–61), as well as works purchased from his own gallery: Ernst’s Dejeuner sur l’Herbe (1944) and Surrealisme et le peinture (1942), Cornell’s large Soap Bubble Set (1948) and Man Ray’s Observatory Time, the Lovers. When, in 1966, Duchamp revealed that he had been working for the last 20 years on the installation he called Étant donnés, it was to Copley that he turned in search of a buyer. It was sold on the condition that Copley donate the work to the Philadelphia Museum of Art upon Duchamp’s death, and it was in his possession for only two years, whereupon Copley kept his side of the agreement. In 1979, when he began to feel burdened by ownership and realized he had burned through most of his inheritance, he sold the rest of his collection at Sotheby’s. The Copley Galleries may now be little remembered, but this reckless experiment by two wealthy young men who had little idea what they were doing except pursuing liberty and pleasure continues to resonate down the decades. Surrealism arguably came to have a greater influence on the art made in Los Angeles in the latter half of the 20th century than any other historical movement. It is hard to claim, of course, that the influence originated in Beverly Hills in 1948. Today, 257 North Canon Drive is a parking lot. Aside from two works by Magritte—The Liberator and The Treachery of Images (This Is Not a Pipe) —which came to LACMA via a more circuitous route, little of Copley’s collection ended up back in Los Angeles. As Copley recalled Man Ray once saying, “There was more Surrealism rampant in Hollywood than all the Surrealists could invent in a lifetime.” 29 The city, perhaps, had no need for an establishment like the Copley Galleries. William N. Copley, “Portrait of an Artist as a Young Dealer,” William N. Copley: X-Rated, (New York: Paul Kasmin Gallery, 2010), p.68. Billy Copley is an artist living and working in New York. Claire Copley is best known for the gallery she ran from 1973 to 1977 on La Cienega Avenue in Los Angeles. Claire S. Copley Gallery was notable for its championing of Conceptual artists such as Bas Jan Ader, Daniel Buren, David Lamelas, and Allen Ruppersberg, and particularly as the location of Michael Asher’s untitled installation from 1974 in which he removed the wall separating the gallery’s office from the exhibition space. William N. Copley, “Portrait of an Artist as a Young Dealer,” p.67. Rebecca Peabody, Andrew Perchuk, Glenn Phillips, and Rani Singh (eds. ), Pacific Standard Time: Los Angeles Art 1945–1980 (Los Angeles: The Getty Research Institute and J. Paul Getty Museum, 2011), p.16, 68. William Nelson Copley, oral history interview conducted by the Archives of American Art, Smithsonian Institution, January 30, 1968. Rebecca Peabody et al., Pacific Standard Time, p.13. Man Ray, Self-Portrait (Boston: Little, Brown, 1963), p.354. William N. Copley, “Portrait of an Artist as a Young Dealer,” p.69. When Copley married his second wife, Noma Rathner, in 1953, Man Ray was his best man and the creator of his wedding cake: a pie tin slathered in frosting. Neil Baldwin,Man Ray (New York: C.N. Potter, 1988), p.260, 298. William N. Copley, “Portrait of an Artist as a Young Dealer,” p.70. Götz Adriani and Judith Irrgang (eds. ), Copley (Heidelberg and Berlin: Stiftung Frieder Burda, 2012), p.174. William N. Copley, “Portrait of an Artist as a Young Dealer,” p.68. William N. Copley, William N. Copley: X-Rated, (New York: Paul Kasmin Gallery, 2010), p.19. William N. Copley, “Portrait of an Artist as a Young Dealer,” p.76. The painting was completed in Paris before Man Ray moved to Los Angeles. It was rescued from Nazi-occupied France by Mary Reynolds, who rolled it up and smuggled it over the Pyrenees on foot in the summer of 1942. Neil Baldwin, Man Ray, p. 262. January 10, 1949, saw the biggest snowstorm in LA on record. For more, see Nathan Masters, “CityDig: A Snowstorm in Los Angeles? It’s Happened,” Los Angeles Magazine(December 18, 2012). William N. Copley, “Portrait of an Artist as a Young Dealer,” p.82. According to his biography, Copley learned later that that group of children included a young Walter Hopps, who would go on to start the Ferus Gallery with Ed Kienholz and curate the first museum retrospective of Marcel Duchamp, at the Pasadena Museum of Art. William N. Copley, “Portrait of an Artist as a Young Dealer,” p.82. In the postscript of a letter from Marcel Duchamp to his friend Henri-Pierre Roché, the artist wrote: “Saw Copley in Calif. He shut up shop after spending 70,000 dollars in a year.” Francis M. Naumann and Hector Obalk (eds. ), Affectt Marcel: The selected Correspondence of Marcel Duchamp, trans. Jill Taylors (London: Thames & Hudson, 2000), p.274. Any inadvertently acquired respectability was tempered by Copley in paintings such as his risqué X-Rated series (1972–74), in which couples cavort on vibrantly patterned bedspreads. First shown at the Huntington Hartford Museum in New York, they have only recently begun to excite the commercial and critical attention they deserve.